Core77 called this the best IKEA hack ever, and there is no doubting both the ingenuity and wit of this video. 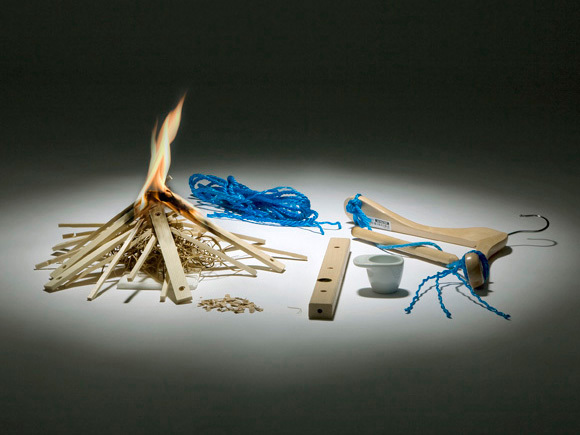 It's almost tempting to put together a kit of parts made from the IKEA products listed just to have an emergency fire starter kit at home. I love the irony of at least one of the SKUs essentially just being firewood. Let's see "Surviorman" man do that. Come to think of it, I now wonder if Surviorman's Les Stroud could last if dropped into the middle of an European city with just enough Euros to buy all he needed to make a fire, shelter and catch his supper. The essentials of life, right? I doubt he'd last the weekend in Stuttgart. He'd probably be captured, raped and eaten by a marauding band of English soccer hooligans.